Sambal Tumis Ikan Bilis and Udang (Prawns) Recipe. 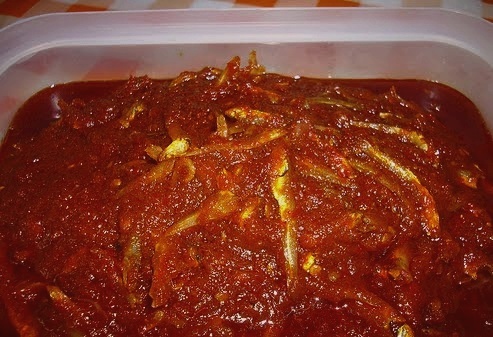 A Sambal (English – Sauteed Chili Paste) can be a condiment, an ingredient or a dish which will always contain a large amount of dried chilies (It is sometimes a substitute for fresh chilies). Sambal Tumis is of Indonesian and Malays origin. It is typically made from a variety of peppers, although chili peppers are the most common. Sambal is used as a condiment for a variety of dishes such as Lontong, Roti Jala or Nasi Lemak. Ready-made sambals are available at food markets or gourmet departments in supermarkets in Singapore. Add in the tamarind water, salt, sugar and aji no moto, lastly add in the prawn or ikan bilis and let it cook and thicken. Serve Sambal Tumis with Lontong, Nasi Lemak or anything you prefer.